This Cabo del Sol private hacienda-style villa is one of our favorite wedding venues in Los Cabos. The vibrant colors in each room, the artwork throughout the house, the grassy lawn area overlooking the ocean for the ceremony, and the expansive terraces by the infinity pool for the reception make it a very special location. 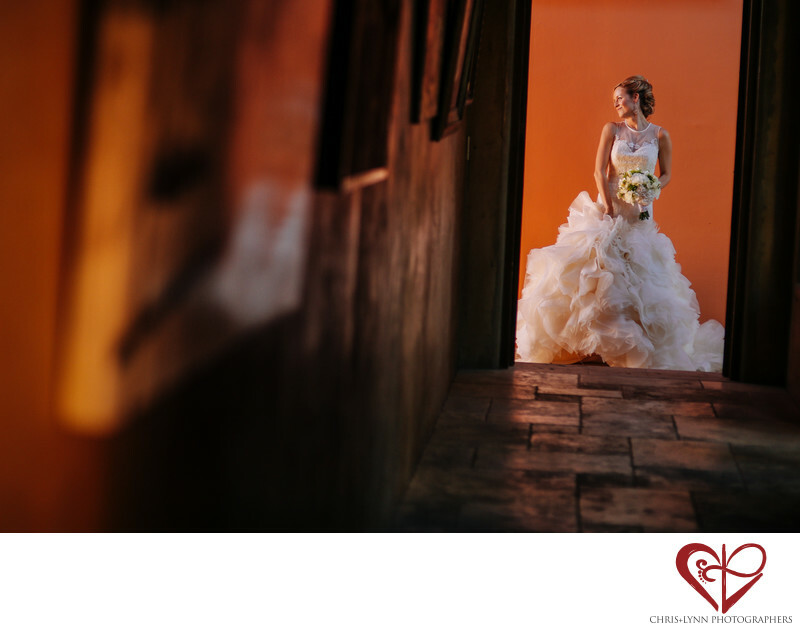 This bridal image was shot at the end of a long hallway a few minutes before the bride was about to walk down the aisle. I'm not sure if her expression is from looking at the ocean view, seeing all the decor setup at the ceremony site, or glimpsing her guests being seated, but her look is that of a very content bride! I love how the light illuminates her face and she is framed by the door. The slight angle of the hallway seems to add to the anticipation of the moment. Private villas are an excellent option for smaller, intimate destination weddings in Mexico. As Cabo wedding photographers, we have found that brides & grooms choosing a Cabo villa for their wedding often have a more fun, less-stressful wedding day than couples who opt for a larger hotel wedding. This Los Cabos destination wedding was featured in the Canadian luxury wedding publication Perfect Wedding Magazine. Location: Cabo del Sol, Cabo San Lucas, Mexico. 1/640; f/1.8; ISO 400; 85.0 mm.